Gift ideas for college students! Teacher gift ideas & More! We are back today with another gift guide for you! And today we are talking gifts for College Students! They also make great gifts for neighbors, friends or family members that are moving, etc- but we hear SO often that people are purchasing them for their kids who have moved away (or are about to!) for school to give them a reminder of home! 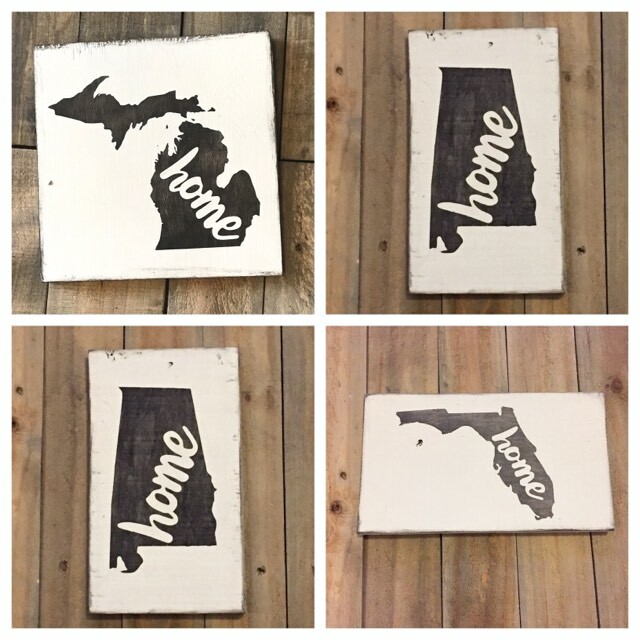 Unlike most of our items these can be personalized with hearts over cities and city names or the word “home. But let’s talk about what they all really want, right?! “Here’s a card with some $$!” just seems so impersonal though, so just like with teacher gifts, we suggest $ AND something else! But if you are are like me, and would rather make it a bit of a thoughtful gift of $$ “and” here’s some ideas! Phone Chargers- they get lost, left at friends houses, or frayed- so not having to spend $ on replacements will be appreciated! Headphones- same as the above! Who doesn’t lose their headphones all the time?! Spring for the good ones (apple ones for iphones etc! ), especially if this is the only gift you are giving. The cheaper ones just don't last! Laundry quarters- break a bit of the $ you are giving up into quarters! State sign to remind them of home. Hope these ideas are helping you guys think of new ideas for gift giving! We are still cranking out online orders and shipping them out within a few days, so let us know if we can help you with your gift giving! PS. Come watch our FB live now on what to do with our Christmas Printables AND keep an eye out for more this week hitting your email inbox! Copyright © 2018 Anchored Soul Designs, All rights reserved.